In large facilities, like industrial warehouses, manufacturing plants and distribution centers, managing air quality can be a challenge. There are a number of conventional options—exhaust fans, HVAC units, high-speed floor fans, swamp coolers––but these traditional routes often fail to provide comprehensive solutions. Conversely, high-volume, low-speed (HVLS) fans mobilize and de-stratify large volumes of air in a way that truly “clears the air” in any facility. HVLS Fans: What Are They? 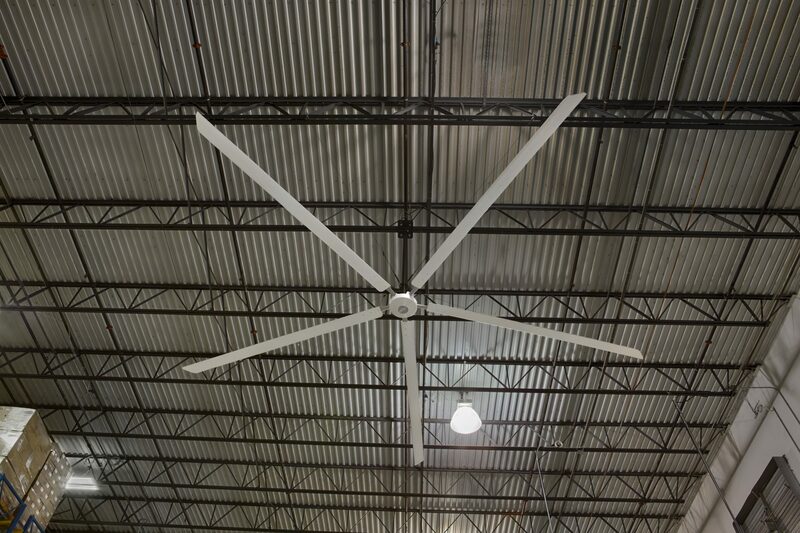 HVLS fans differ from traditional high-speed floor fans in a number of ways, including their reduced noise, minimized energy consumption per square foot and significant cost savings—HVLS fans require less than $1 per day to operate. They also prove to be safer than alternative options due to their cordless design, eliminating trip hazards—an important factor considering many plant and facility managers identify cords as one of the top workplace hazards. Another distinguisher is that in addition to regulating warm climates, HVLS fans also focus on establishing and regulating cool climates, while conventional, high-speed fans serve as a single point source with a limited coverage area. During the warm summer months, one HVLS fan can replace as many as 10-20 floor fans or 12 48-inch barrel fans, effectively creating a perceived 10-12-degree cooler temperature environment. Equally as important are the winter months. A quality HVLS solution will continually push warm air trapped at the ceiling level back down to the floor, saving up to 30 percent on heating costs and evenly distributing warm air. However, it’s been proven that air quality can be improved by simply increasing air circulation. HVLS fans are particularly adept at this, providing large-scale airflow that regulates temperature while preventing stagnant air and dust. High air turns also help eliminate toxic airborne chemicals. Additionally, HVLS fans can manage a facility’s moisture, which can form on the walls and equipment on the plant or factory floor between two different climate-controlled environments. Proper indoor air movement can quickly dry this condensation to reduce fall risks, pollutants and bacteria associated with unchecked moisture. 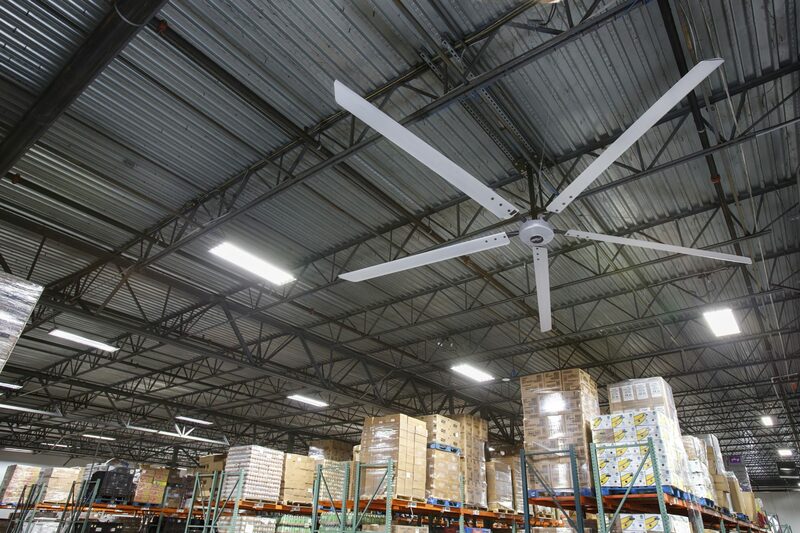 One manufacturing and logistics company experienced improvements in workforce conditions and productivity after installing seven 24-foot HVLS fans in their unconditioned 300,000-square foot warehouse. Their previous cooling methods included pedestal and barrel fans, which were both ineffective and inconvenient in a facility of its size. The company also experimented with swamp coolers, but the resulting maintenance proved to be a headache. Regardless of industry, your company’s success is ultimately built off of the safety and health of your workforce. Managing your facility’s indoor air quality is one of the first—and most impactful—steps you can take to ensure workforce safety and overall employee comfort, and choosing the right HVLS solution is crucial to the success of this step. At Hunter Industrial Fans, we created a purpose-built product to make every space a better place. You can learn more about our industrial division and products by visiting www.hunterfan.com/industrial. Jeff Watson is the Senior Vice President and General Manager for the Hunter Industrial/Commercial Division. Prior to Hunter, Jeff was the Vice President of Product Management and Marketing for Ingersoll Rand/Trane North America where his responsibilities included leading product management, marketing to build product and system plans to grow share and profitability as well as defining and executing strategy for marketing and vertical sales. Before his time at Trane, Jeff spent three years with Hercules Inc. Watson earned a Bachelor of Science degree from Clemson University in mechanical engineering. He has been married to Nanette Watson for 30 years and together they have three sons and eight grandchildren. Jeff enjoys tennis, biking, fitness and outdoor activities.